Are you looking for unadulterated nature and relaxation on top of that? If yes, then you came to the right place. This beautiful farmhouse lies just outside the centre of the city. On the second floor there is a typical apartment with rustic furnishings for up to 4 people. In the summer and winter there are enough activities right on the doorstep that your holiday will fly by. A highlight of this accommodation is that you can buy fresh produce directly from the farm, and in the winter high season the homeowner offers a roll service. 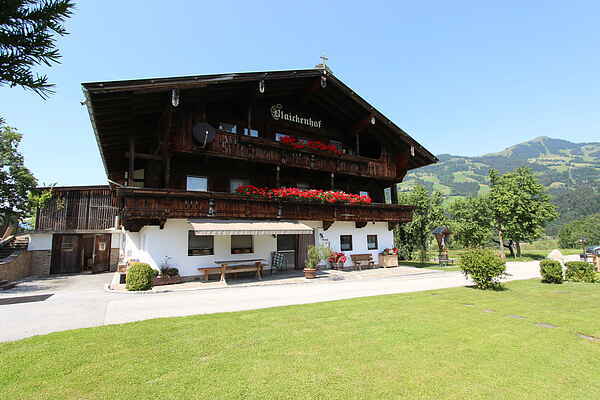 The house is surrounded by a large garden and you have a sunny terrace from which you have a beautiful view of the Kitzbühel Alps. The free ski bus stops almost right at the door and quickly takes you to different skiing areas: You have the choice to go skiing in Hopfgarten (approx. 4 km) or Westendorf (approx. 6 km). Holiday on a farm with animals!